Topics: Weddings, and Prom Rentals. a-zformalwear.com A-Z Formal Wear - North Miami, FL- Prom Rentals - Tuxedo & Prom ..
a-zformalwear.com A-Z Formal Wear - North Miami, FL- Our Tuxedos - Men&apos;s Tuxedo ..
dns01.gpn.register.com, dns02.gpn.register.com, and dns03.gpn.register.com are some of its 5 Nameservers. Icon Developments (Utah, Lindon) is the location of the Resin/3 server. 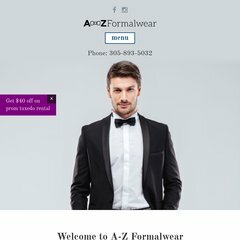 A-zformalwear.com's server IP number is 192.41.9.25.